By the mid 1950’s over 200,000 imported cars were being sold annually in the US. Sensing a market opportunity, a number of entrepreneurs and/or manufacturers tried their hand at cracking the large American market and emulating VW’s success. It turns out that Heinkel was one of them. I’d always been under the impression that Heinkels were never “officially” imported, and that the vehicles here arrived with returning servicemen or the occasional stray import. I was wrong. 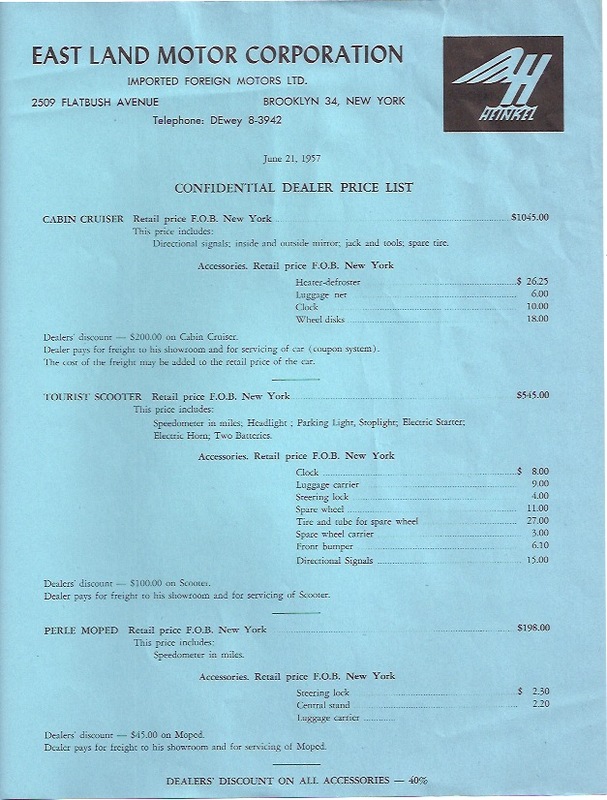 My friend Rob Maselko from NJ provided me with a scan of a dealer application packet. You wanted to be a Heinkel Dealer in the 1950's? 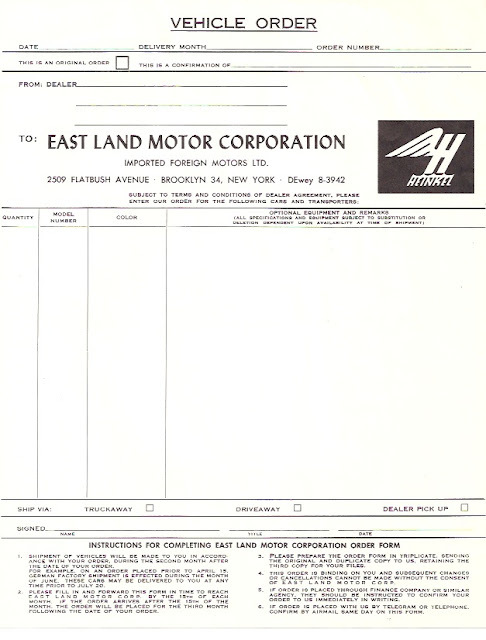 The East Land Motor Corp. was going to give you your chance. The prices on the sheet seem inexpensive, but a little perspective is useful here. The best selling car in 1957 was the full size Ford (not the iconic Chevy like you might have thought). The entry level Ford at that time had a base sticker of about $1,900. 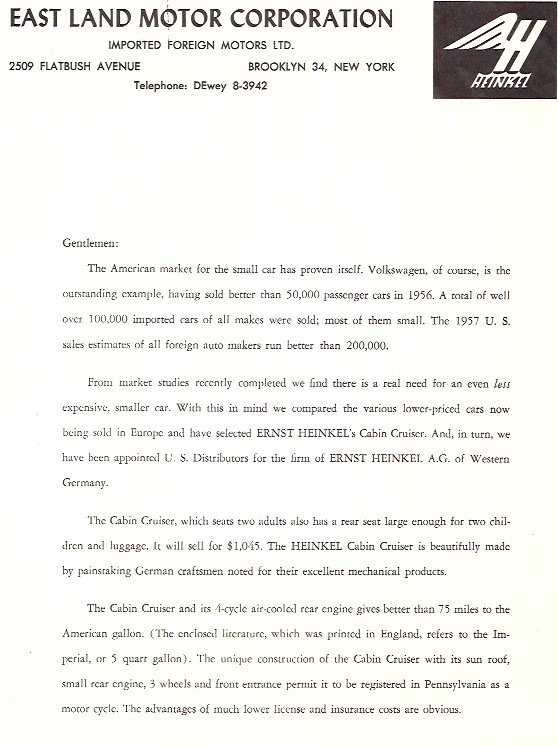 VW’s (with annual sales US sales of about 50,000 in 1957) had a list price somewhere in between. Since I’m a scooter guy I was very interested in the scooter prices. The clock would have been the best investment in the accessories area, since they go for hundereds of dollars now! Ultimately EastLand was not successful. It’s hard to tell how many Heinkel dealers were actually established, but it appears there were less than a handful, if any. 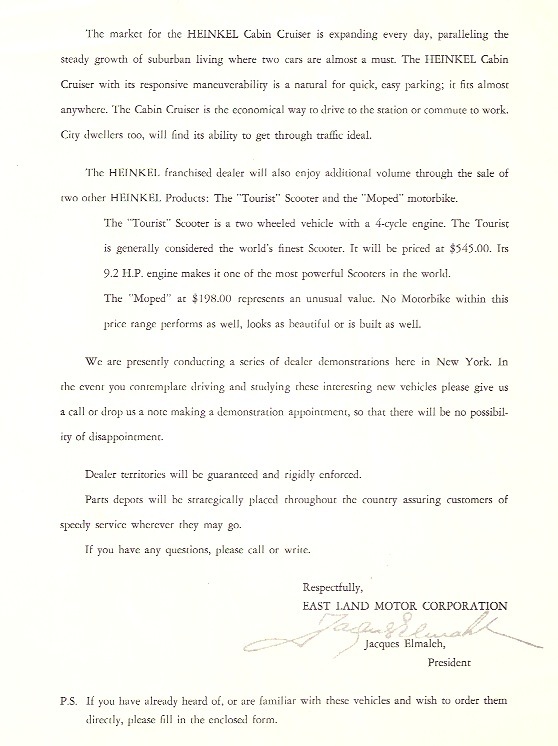 According to John Gerber, who wrote the definitive history of Heinkels in America (you can read it at http://www.heinkeltourist.com/heinkelUSAhistory.htm ), 15-30 cars were imported and Eastland gave up or lost their East Coast distribution rights in late 1958 or early 1959. Heinkel was only marginally more successful with scooters; an estimated 350 were sold by dealers in the US through end of production in 1965. Welcome to the Heinkel Cars Blog. I'm going to document my ongoing Heinkel car projects and provide information of interest to Heinkel Car fans. The Heinkel Engine "Hall of Shame"
© 2012-2013 Heinkel Cars, Kabines, and Cabin Scooters All Rights Reserved . Picture Window theme. Powered by Blogger.